There's an art to shooting tradeshows. Show management has more than enough to do. They need a story teller who understands their needs. I design photographs to show exhibitors coming together with their customers, sponsors gaining mindshare, presenters connecting with their audiences, and attendees coming together to find new tools, to learn, to network, and to have a great time in the process. Great trade show photos remind current exhibitors, attendees, and sponsors, how productive and enjoyable the show was. They also make great tools to help management encourage new exhibitors, attendees, and sponsors, to sign up for the next show. Please check out individual photo comments for tips on the stories each photo is designed to show. I love shooting tradeshows, engaging my subjects, helping them feel at ease and enjoy themselves, as we get great photos to tell their stories. Call me if I can help. John Gaudio, 303-870-1044. 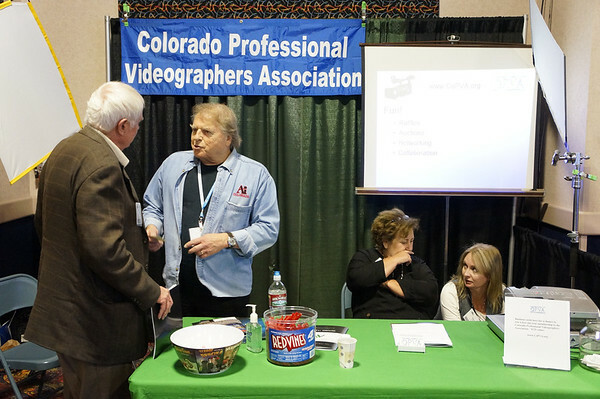 Here the camera is held hig to avoid covering the Colorad Professional Videographers Association banner, and positioned to the left so the screen doesn't block the last word. People engaging is the theme.